In UK stores now is a special edition of Record Collector Magazine, completely focused on Pink Floyd. With the sub title of Shooting For The Moon, the magazine brings together both old and new from the long-running, respected publication. It traces the development of the band, from their psychedelic beginnings in 1967 through to the recent closed Their Mortal Remains exhibition at London's Victoria & Albert Museum. 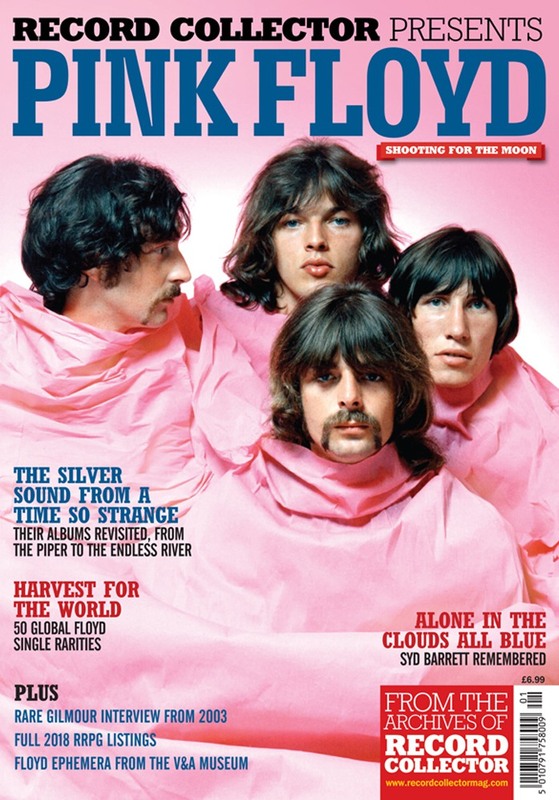 The 116-page "bookazine" combines coverage from Record Collector’s Pink Floyd archive with freshly commissioned articles from David Quantick, Kris Needs, Daryl Easlea and Oregano Rathbone, featuring in-depth profiles of each album, and a delve into the band's solo output. There's also rare photographs and a UK discography with single, EP and album values. Of particular interest is an interview with Nick Mason looking at the early days of the band, which elicits some fascinating views and insights. It's also intriguing seeing some of the older articles reprinted in this collection, discussing the state of play in those days with regard to, say, video material concerning the band. Some of the prices quoted could be argued to be rather debatable, and there are the odd factual errors here or there, but irrespective of that, it's a great read, and worth tracking down. The eye-catching cover should leap out at you (figuratively speaking) from the shelves. If your local store doesn't have it, you can order it online, for shipping worldwide, via shop.RecordCollectorMag.com.